A near-encyclopedic volume on Cuba was recently published by Charles Scribner’s Sons but has received surprisingly limited publicity- at least from my perspective up here in winter-time in the True North. I have not yet seen the volume myself nor have I even seen the Table of Contents. However, the description of the substance of the volume below looks interesting. If my finances were infinite, I would certainly buy a copy, even though the price ranges from $284.44 to $454.95, depending on the seller. In an exceedingly complex and changing global situation, understanding Cuba is an important and challenging task. The Scribner CUBA: People, Culture, History is a reference work that goes beyond a mere presentation of facts, biographies, and “ready reference” information, which is widely available on the Internet, to offer deep interpretation. The book will offer on the one hand, twenty-one interpretative essays on major topics in Cuban history, culture and society, as well as over one hundred twenty-five shorter essays on artistic, literary, and nonfiction works; major events and places of cultural significance. The major essays will not only cover Economics, Sugar, Tobacco, Religion, and Food, but also Cuba and its Diasporas, Ecology and Environment, Sexuality, Gender, Race and Ethnicity, the Arts, Language, Sports and Cuban Ways of Knowing and Being, among others. The short essays will focus on specific literary works, photographs, paintings, political documents, speeches, testimonies, historical dates, key places and cities on the island and abroad. For example: literary works include “Los Versos sencillos”; “Paradiso”; and “The Mambo Kings Play Songs of Love”; works of nonfiction include: “Cuba: Azúcar y Población”; “Indagación del choteo”; and “La historia me absolverá”; works of visual art: “La Jungla”; and “Los Hijos del agua conversando con un pez”; works of music: “Guantanamera”; “Misa cubana”; and “Mambo #5”; cinema: “Lucía”; and “Fresa y chocolate”; events: “Violence and Insurrection in 1912: A Racial Conflict”; and “January 1, 1959”; and places of cultural significance: “Baracoa”; “Holguín”; “Isla de Pinos”; “Spain”; and “New York,” to name a few examples. By combining longer overview pieces with short and focused descriptive and analytical ones, CUBA aims to give the curious and interested reader a way to comprehend the country by presenting the major forces that have shaped the island historically and culturally. Rather than overwhelm the reader with thousands of entries and biographies, CUBA offers a close look at major themes that are emblematic to the country’s unique history. 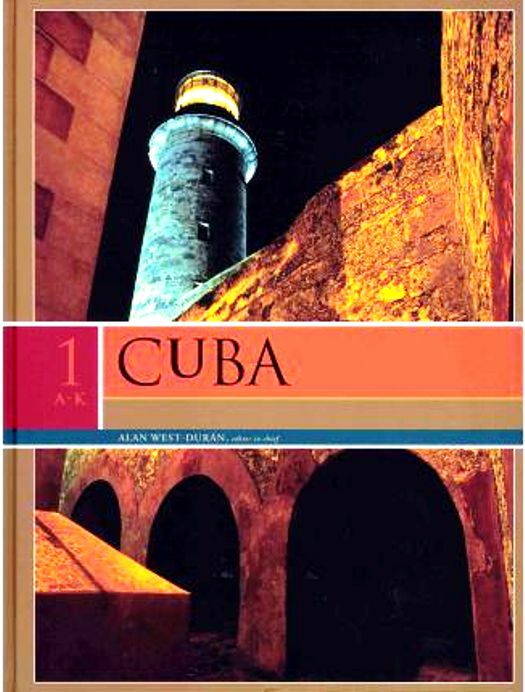 CUBA is a reference guide for readers undertaking a journey of comprehension; it is not a work that presumes to have all of the answers. This entry was posted in Blog and tagged Agriculture, Economic Melt-Down, Economic Recovery, Economic Reforms, Foreign Exchange Earninigs, General Economic Analyses, Rectification Process, Special Period, Sugar Sector. Bookmark the permalink.